Back Row: L-R: Lionel Mitchell, ?, John Hendry,Christie ?, George Stephen, Alistair Ramsay, Willie Forsyth, D Bain. Second Back: Nuttall, Willie Shaw, Ted Aburrow, Jimmy Purdie, W Vass, Heckie Murdoch, Kenny MacDonald, Calum Ross. Third Row: Isobel MacKenzie, Jessie Ross, Innes, Joan Worsfold, ?, Nancy Bell, ? Nana Ross, Catherine Munro, Agnes Borley, Sybil MacKenzie, Margo MacKay, B Miller, Annabel Ross, Dolcie Francis, Jean Cross, Poppy Ross, Ryall Dunn, Gillian Oliver. Front Row: Matheson, Betty Archer, Catherine Davidson, Wilma Grant, Doris Bryce, Patty MacDonald, Margret Shivas, David Davidson. 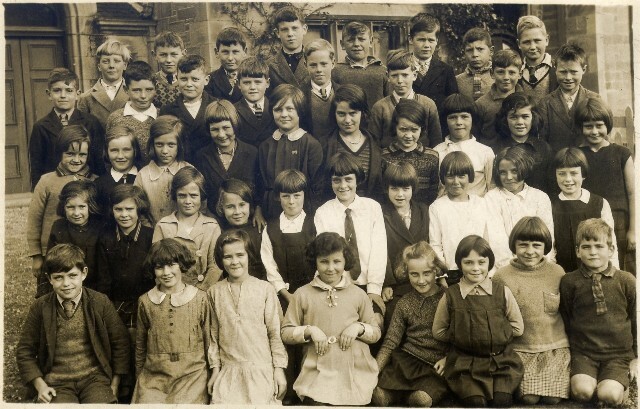 My Mother, Nana Ross, who is 3rd from the right on the third row, was delighted when I showed her this school photograph taken in 1932 when she was 9 years old. My Mother left Invergordon to live in Swindon, Wiltshire, 22 years ago and she is now a proud Grandma to Alexandra and Great Grandmother to Oliver aged 7. I think that Willie Shaw was in the RAF, and was killed in the War, as was Kenny MacDonald. It was Donald Bain and Willie Vass. Betweeen Nancy and Nana, is that Dolly McPherson? Patty Macdonald was small, but a very fast runner! I must have just missed being in that photo, arriving in Invergordon from Saltburn not long after. My mother, Sybil MacKenzie remembers most of the class. She moved from Saltburn School to Standard 3 in Invergordon (Primary 5 now). She still is in touch with Joan Worsfield ( now Peer) who lives in Carleise, Ontario. We have noticed the comments by Jet Robb (Andrews). Kenny MacDonald was not killed during the war, he died many years later; Kenny MacDonald was my uncle, my mother being Poppy MacDonald. What a wonderful web sight - my mother and I have spent many hours looking at it. Wonderful to see this school photograph of my aunt Patti and Uncle Kenny - does anybody remember my mother Poppy, Patricia Wickens? I wonder whether Lionel Mitchell is my cousin? He was a grandson of Annie and George Mitchell. Lionel was a piper in the Blackwatch, and lived most of his adult life in Oxford, England. He died several years ago. Hi, sorry for "hijacking" the comments page, but if Karen Graham sees this I'd love to get back in touch - I've lost your email address and you haven't got it listed on this site. We emailed a few times 3 or 4 years ago and your mum shared her memories of my g-grandad George Mitchell when she was growing up in Saltburn. If anyone knows how to get in touch with Karen, please feel free to pass on my details or if anyone else remembers George, Annie or any of their 16 kids I'd love to hear from them too. What an amazing old picture; I have just seen it for the first time. Many names mean nothing to me but some were adults when I was a kid and it is weird to see them as children. Doris Bryce leaps out of the picture--I had no idea she was local and ended up teaching at her old school. As Harry says: she was welcome eye candy for the boys in school. I would like to get in touch with Joan Worsfold (mentioned above) as I believe she is related to my aunt - I only discovered this recently while helping to trace her family tree. I have just seen this and picked out my granny - Poppy Ross straight away (as did my husband)..... she looks like my mother and myself as young kids. What a great picture...thanks. I’m not sure, but the name Worsfold is a bit uncommon and as my daughter married a Thomas Edward Worsfold, is there any connection? To the best of my knowledge, he came from London and is now seriously ill in Cornwall. Jill, you are right, your Mam and you are very like your Granny. My Mam (Aileen Lamb) used to work with yours. I met her in the hospital last year while she was visiting someone, she hasn't changed a bit. Hope you and your family are all well? Lorna, I asked my cousin if she had any news of Joan Worsfold as her mother, Hazel Mackenzie and Joan were good friends. William, Joan's Dad worked with my Uncle David (Hazel's Husband) in the Dockyard. Joan did emigrate to Canada with her parents in 1957/8. Joan re-married in Canada to a man called Hugh Peer. Their last known address (2006) was P.O Box 71, Carlisle-on-Lor, IHO. I hope that will help you. I am keen on Family History myself so I know how frustrating it is to come to a dead end!!! Nancy Bell was my nan's half sister Doris Maclean Bell or Doris Bell Maclean. Bunty (Thomina Bell) was mother to both Doris and Nancy. If anyone has any info please get in touch. Doris was born 1916. Ted Aburrow (Aborough) was my uncle and the brother of Alice Aburrow who died aged 90 in 2004. She was born in Harbour House Invergordon in 1914. The Aburrows originated from the Meon Valley in Hampshire and can be traced back 500 years. Does anyone know of a school photo which might include my mother? Does anyone know if Jessie Ross was from Shandwick? Age looks about right to be my Aunt. Willie Forsyth my dad still lives in Invergordon and still fit and healthy at 93! They were a different breed Gavin, I send Willie and Maude a card every xmas and receive one in return. Please pass on my regards to them both, thanks. Hi Margaret Dixon, I have fond memories of (great) uncle Herbie, I will email you. Hi Hilary that would be very nice. How is everybody over in Australia. Don't hear anything from Oxford now just don't know if anybody is still around. It was nice to hear from you. Margaret Dixon, I emailed you in Feb but not sure if you got it. Can you contact me? Annabel Ross was my mother. She lived at 171 High Street. Wilma Grant and Doris Bryce were bridesmaids at her wedding and Doris was my godmother.